Gold, frankincense, and myrrh are emblems of Christ’s kingship, divinity, and suffering respectively, applying to humans as Christ’s image, studied in the profoundly gifted. The purpose of this paper is to look at the features of Christ confessed gifts of gold, frankincense, and myrrh as features playing out in humans, and exploring what concrete shape this playing out takes in the so-called “profoundly gifted.” (Kingship, divinity, and suffering play out in equally significant ways for other populations, but the scope is primarily limited to a segment of the stated population.) “Profound giftedness” is used a standard psychological technical term, if a quite flattering label for a more ambivalent experience. Profound giftedness is explored as one of many experiences that looks different from the inside and from the outside; paradoxically, what looks different from the inside and outside is in large measure its particular expression of human commonalities. (This could be said for many other populations as well.) Profound giftedness as an expression of being human is explored, in the (royal and) divine image, in particular the rule over Creation through work, alongside a particular expression of suffering, while being attentive to the fact that profoundly gifted people both suffer and cause others to suffer. Suffering is explored in light of Orthodox experience before the essay closes by applying lessons learned in looking at profoundly gifted difference to human difference as such. Profound giftedness experience combines extremes, including both privilege and marginality. This study looks at the profoundly gifted experience of being human, and owes a considerable debt to studies of the human experience of the marginalized, while drawing from other traditions including the Orthodox. Profound giftedness is not described as exception to the normal human rule but as the univocally applied human rule given further specification that could be given different further specification for other populations. There is an understanding of symbol/image that plays out in this paper’s treatment of the image of God and the symbolic character of the magi’s gifts. If we look at the question, “Does a symbol represent and embody or represent only?” an Orthodox perspective is that a symbol or image both represents and embodies. A proper symbol is neither arbitrary nor detached but connected to what it represents. Hence Kallistos Ware answers the question of whether Orthodox pay undue devotion to wood: “The icon is… a symbol; the veneration shown to the images is directed, not to stone, wood, and paint, but towards the person depicted.” We shall see in a moment that the person is in turn a symbol of Christ, but the immediate point is the understanding of symbol that undergirds such a position. It is the same understanding of symbol that says that the Gifts of the Magi were not given arbitrary imputed symbolism, representing without embodying. Not only do they both represent and embody, but there are layers of symbolic resonance, and that resonance informs this paper as does the precedent in Ephrem the Syrian, a poet of the first rank, treating a fluid rather than inflexible treatment of the symbols’ precise meaning. It is a deceptive understatement to call Christ a norm to humanity. To be human is to be made in the image of God, classically understood as “in the image of the Trinity,” as Ware attests, and this image specifically includes the image of Christ. Part of this image plays out in treatment of others: Ware writes “Monastery guests, as St Benedict of Nursia (c.480-c.550) wrote in his Rule, are to be received ‘as Christ himself.’ In similar terms, the fourth-century Egyptian Abba Apollo insisted, ‘We should bow down before those who come to see us, for we are bowing down not before them but before God. '” This principle is in no sense unique to monastery guests: in Mt 25.31-46 the righteous are separated from the wicked in the last judgment according to how they treated Christ through their treatment of the downtrodden, with no distinction being made for religious persuasion. One’s treatment of another is one’s treatment of Christ tout court. Christ lies at the heart of humanity and his image in every human reaches the point that one cannot do good or ill to another human, Christian or not, as someone detached from Christ because there is no such thing as someone detached from Christ. This is tacitly tied to a norm in a much deeper sense than a norm extrinsically imposed de jure, whether or not it fits a person originally independent of that arbitrarily imposed norm. One can have something to do with Christ without encountering Christianity: the relevance of Christ does not enter the picture only in relation to explicit identification with Christianity. Ashbrook Harvey mentions a “universal patristic exegesis” of gold as emblematic of Christ’s kingship, frankincense of his divinity, and myrrh of his suffering. In patristic sources this exegesis can be tersely stated, but at other times there is fluidity and resonance: in Ephrem the Syrian myrrh intercedes for swords used in aggression, gold intercedes for treasures plundered from King Hezekiah, and frankincense appeased divinity. The three basic meanings are here cast in a touching light of reparations for the magi’s ancestral offenses against Mary’s ancestors. This paper’s method is informed by how in Ephrem the three gifts were not limited to a single rigid meaning but could be flexibly applied in different ways. Frankincense was a complement to anointing oil; Ashbrook Harvey writes, “…incense took its base meaning from its identification with sacrifice. Incense served as a medium for human initiative towards the divine, and its fragrance marked the process of human-divine encounter. Holy oil, by contrast, represented divine initiative towards the human.” Incense could signify human approach to divinity, or divinity itself. Myrrh was associated with suffering and death. Concordance search results for “myrrh,” “spices,” or “ointment” (in the RSV) reveal an overwhelming number of Gospel references explicitly connected to the passion: the Gospel reference to myrrh, spices, ointment, etc. pave the way for the Fathers to tie myrrh to suffering and death. Gold is less thoroughly explained in Ashbrook Harvey and seems to be one of those objects of study poised to slip through the cracks of what is considered “doctrinally significant:” prior research to support an argument appears scanty, leaving primary sources the best available resource. Kittel and Fitzgerald lack entries for “chrysos”/”gold.” This may be a difficulty, but it does not stop one from looking at the other two gifts, and patristic treatments of kingship can presumably illuminate gold as an emblem of kingship. Chrism is almost a fourth gift besides the three, and in a way is prior: it cuts deeper, and we call Christ “the Christ,” meaning anointed Prophet, Priest, and King. The oil and the Holy Spirit are paradigms for each other. Anointing was important in baptism and some sources make baptism more a matter of oil than water. John the Baptist announced one who would baptize with the Holy Spirit and with fire, and perhaps oil rather than water explained baptismal anointing, with the Holy Spirit and with fire, to make little Christs. Not only myrrh for suffering, but gold for kingship and frankincense for divinity, are basic to being human and constituted by the image of Christ. The anointing with the literal-and-more-than-literal chrism that makes prophet, priest, and king applies to Christ and Christians. It is not only the pre-eminent gift of chrism that is connected with what it means to be human. The Gifts of the Magi are ultimately gifts to humans who bear Christ’s image. Genesis 1 ties the divine image to human rule. The language used is of an idol image of a deity that carried the deity’s essence and through which the deity’s work was accomplished. Furthermore, a good portion of the words in Genesis 1.26-8 are devoted to the relationship between the human and the rest of material Creation. To cite one patristic example, Basil of Caesarea can spiritualize rule over animals by discussing rule over oneself, but alongside an a fortiori implied argument, “Let them rule over the fish. We were, in the first instance, given power over animals who live elsewhere. [God] did not say, Let them rule over domestic animals, but over fish:” humans have a powerful authority over the animals that goes beyond domestic animals to even effectively apply to fish. Our relation to the natural world is a relation as royalty made to rule. Anestis Keselopoulos explains this point: “[St. Symeon] has a strong feeling for the fact that man was created to function as king of creation.” Gold and frankincense do not begin to describe humanity in Christ’s shadow. They already describe the divine image in Genesis 1. That the texts above connect to work is foundational to John Paul II’s Laborem Exercens. He argues, “Man is made to be in the visible universe an image and likeness of God himself, and he is placed in it in order to subdue the earth. From the beginning therefore he is called to work,” making subduing the earth and human rule the bridge between the imago dei and work. The royal, divine image expresses itself in work—perhaps not only work, and perhaps “work” needs to be more broadly understood than “remunerated labor,” but on the Genesis 1 account the one holy day of rest is only achieved after the six days of the Creator himself working. One can scarcely ask for a higher valuation of work than to say the world was created by God’s work (perhaps over billions of years), and as the Father works, so does the Son (John 5.17). Work is a defining feature of humanity (although not the only important feature). Work is part of human glory, part of the gift of gold and frankincense. The archetypal command to rule Creation is a command to work, and to be king is to rule through work. Properly understood, work is at the core of what Keselopoulos gives great moral weight, one’s “relationship with the things in creation.” Work is the outward operation of the image of God, and relating to the world virtuously is partly a matter of loving work. Madeleine l’Engle describes service that is close to the heart of work: “If the work comes to the artist and says, ‘Here I am, serve me,’ then the job of the artist, great or small, is to serve.” The artist does not take first initiative but responds by serving an as yet unformed Creation that needs to be loved into its full being. We will further explore this image later. I am wary of using the term “genius” for several reasons. Of all the common terms in psychological literature, “genius” is most problematic. It is difficult to say “genius” and only imply a claim of ability; invariably there are half-conscious associations evoked which approach being a morally separate class of creature who has a higher calling and is not bound by the same rules as mere mortals, much like the pathological conceptualization of the “exceptional man” critiqued in Crime and Punishment. “Genius” comes with a mystique, or, to be more precise, is largely a mystique. 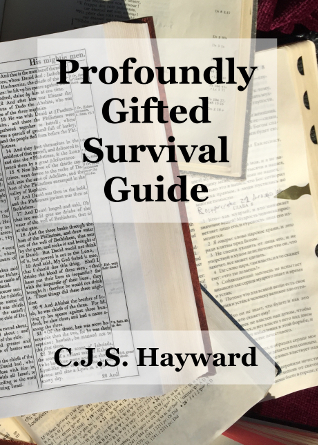 “Profoundly gifted” is not a synonym for “genius,” and I will use the imperfect “profoundly gifted” not because it is perfect (it isn’t), but to avoid forcing readers to deal with my own invented term when a standard term exists. “Genius,” even besides its connotations, denotes someone who leaves behind work of enduring value, and I believe it is possible for profoundly gifted to make no such achievement, and for that matter to do poorly at certain ordinary achievements like economic self-sufficiency. The narrow technical term “profoundly gifted” overlaps the term “genius” (if the latter is stripped of its mystique), but the overlap is incomplete, with one neither necessary nor sufficient to ensure the other. Having considered what amount to limited options, all of which have drawbacks, I will use the term “profoundly gifted” as being the least problematic, even if it is a flattering way of describing an ambivalent condition. While the language of “giftedness” has Biblical origins, I am using technical terms which depart from the Biblical usage and which I treat as having important differences from the Biblical way of framing gifts. Theologically, the quite different Biblical conceptualization is to be preferred, and I will use psychological terms even if it might be theologically preferable to have another terminology besides that of giftedness to refer to this particularly obscure form of human giftedness. I Corinthians 12 never speaks of “gifted” (as opposed to “non-gifted”) people, and in the parable of the talents, the servants admittedly differ in how much they receive, but they do not differ in having at least one substantial “talent” entrusted to them, meaning at least sixty-five pounds of precious metal. It is not only the profoundly gifted who have a place and a quite significant gift for the greater, common good, nor does one need to be psychologically labeled as “gifted” to count as a human being. Furthermore, this discussion is limited in its scope and does not treat other forms of giftedness even if one departs from the Biblical baseline that true talent and giftedness are for all, not a few. Daniel Goleman’s Emotional Intelligence: Why It Can Matter More than IQ is controversial, but Goleman takes a look at one of several of the intelligences treated by multiple intelligence theory, and at very least makes a significant argument of exactly how success may be more a matter of emotional intelligence than the specific type of intelligence treated within the scope of this paper. Even broader would be a serious attempt to treat not only intelligences but the broader category of aptitudes, which seem practically infinite in variety. Work is a defining feature of humanity and can be neither limited to nor centered on the profoundly gifted, but there is something that shines in the work of the profoundly gifted. But before I go further about that, I need to explain a feature of traditional psychological research in this domain. Leta Hollingworth, who was highly influential in how psychology subsequently came to approach giftedness and was the founder of gifted education, expressed concerns that Francis Galton’s Hereditary Genius identified gifted people by established adult reputation, after interventions no longer help much. She suggested that one shift focus to gifted children, which has left a curious lacuna in the psychological research: study of gifted people is first and foremost study of gifted children. Therefore, the research that is available deals primarily with gifted children and I will be looking at children. He was relatively large, robust, and impressive, and was fondly dubbed “Professor.” His attitudes and abilities were appreciated by both pupils and teachers. He was often allowed to lecture (for as long as an hour) on some special topic, such as the history of timepieces, ancient theories of engine construction, mathematics, and history. He constructed out of odds and ends (typewriter ribbon spools, for example) a homemade clock of the pendular type to illustrate some of the principles of chronometry, and this clock was set up before the class during the enrichment unit on “Time and Time Keeping,” to demonstrate some of the principles of chronometry. Mr. Kearney reports that since Michael was very young, he has seemed to spontaneously manifest both factual knowledge and conceptual comprehension that no one has taught him. He recalls an incident when Michael was three years old . . .
Mr. K: Michael at three coming up to me—when I came up to me and he said “Dad, Dad! I’ve got to show you this, got to show you this!” And he showed me the commutative rule of algebra. And I said “Michael! That’s great! Where did you learn that?” “I don’t know. I just made it up!” And then he goes “Wait, Wait! There’s more! There’s more!” And then he showed me the associative rule. In searching for an explanation for this phenomenon, Mr. Kearney has considered a number of possibilities—including an analogy to Platonic philosophy . . .
Mr. K: Just in terms of some of his mathematical ability—some of the cognitive abilities. Some of the fact knowledge that he knew. But we didn’t look at those as telepathy or spiritual things. It was more platonic. I think our experience, if anything, would be related to Platonic Forms. He seemed to be able to go in and take things out of another dimension and apply them—things that you wouldn’t normally know, he knew. I mean, I don’t think the issue was whether or not anyone taught him or not. It was that they were available to him and on occasion, he could dip into a location and bring things up. He has a cognitive ability to see things whole. There is a sense in which a staggering intelligence is the baseline of being human: the most important sense of intelligence is not any of the intelligences on a multiple intelligence scale and in fact not something that some people have more of, but something like embodiment that is simply part of the baseline of being human: this sense of intelligence forms a necessary context to achievements like the above which, taken out of context, suggest that there is a very occult phenomenon manifest in a very few, showing “ordinary” intelligence to be trivial. That would be a deep misunderstanding of intelligence in all parties. The intelligence described in the above quotation is in fact something spiritual, along with “ordinary” intelligence, but there is something easier to see in this kind of achievement even if one has grown insensitive to ordinary intelligence as a spiritual feature of the divine image at work. Profound giftedness exists in continuities with broader human intelligence: artwork in a gallery, at its best, need not dazzle in a way that “shows” that nothing outside the gallery is beautiful; one can visit an art gallery and have one’s eyes opened not only to the art but the world the art is drawn from. If the royal, divine image expresses itself in profoundly gifted work, the expression of the image in work is not an ontologically distinct faculty that the profoundly gifted have that not everybody else has. There is, however, a qualitative difference, suitable for thick description. This quality would not be rightly identified in any sense as an exclusive or even primary shadow of the Theotokos in the Annunciation, but among many polarities and many kinds of difference work for the profoundly gifted resembles the Annunciation in one among many ways. The incarnation was not only the work of the Father, by His power and by His spirit, but it was also the work of the will and faith of the Virgin. Without the consent of the Immaculate, without the agreement of her faith, the plan was as unrealizable as it would have been without the intervention of the three divine Persons Themselves. It was only after having instructed her and persuaded her that God took her for His Mother and borrowed from her the flesh, that She so greatly wished to lend Him. Just as He became incarnate voluntarily, so He wished that His Mother should bear Him freely and with her full consent. Creative work, and much of the serious work of the profoundly gifted, is a minor incarnation and the fruit of a minor annunciation. Madeleine l’Engle writes, “The artist is a servant who is willing to be a birthgiver. In a very real sense the artist (male or female) should be like Mary who, when the angel told her that she was to bear the Messiah, was obedient to the command.” It is the bearing of a Creation that comes to one initially unformed, not yet given concrete shape, and one gives to it out of one’s nature, loves and serves it into being; one gives it one’s own flesh until it has become enfleshed and ready to meet the world. There are other dimensions to the connection—perichoresis or interpenetration of bearer and gift, and a spiritual discipline l’Engle calls “almost identical with adoring the Master of the Universe in contemplative prayer”—and the process, meditated on throughout Madeleine l’Engle’s Walking on Water, is not unique to the profoundly gifted, who are not correctly understood if they are viewed simply in terms of differences without attention to human commonalities. But it is the textured shape taken by the human gold and incense for many profoundly gifted. Suffering is a basic part of human life. It takes different forms, perhaps, but it is constitutive of human experience. Furthermore, there are a great many human experiences that are different from the inside and from the outside. If this is explored with regard to the profoundly gifted, this is not as something that sets the profoundly gifted apart, but exploring further the concrete human form of human universals that are given further specification one way for the profoundly gifted and are given further specification other ways for other populations. Giftedness as studied in this paper does not automatically include emotional intelligence, but it does not leave emotional life unaffected: for the entire range of giftedness, and not only the profoundly gifted, “giftedness has an emotional as well as a cognitive substructure: cognitive complexity gives rise to emotional depth.” This has a marked positive aspect; it makes it easier to have a rich inner life and to experience joy, but “[i]ntensity, in particular, must be understood as a qualitatively distinct characteristic. It is not a matter of degree but of a different quality of experiencing:” it is as if at an age where children of a particular bent are given toy power tools, the range of gifted children are left to contend with real power tools, leaving more positive possibilities but also more ways of getting hurt that for many children simply aren’t an issue. This kind of inner life is a mixed blessing when it comes to experiencing difficulties. This experience is a hint of the dark side of the profoundly gifted experience. Profound giftedness offers real advantages, and no account of it is complete without accounting for what seem almost like magic powers. Giftedness is a privilege, the more the better, or is commonly assumed to be such kind of unqualified privilege so that saying that giftedness is painful comes across like saying that riches are painful. Yet if it is a privilege, it is a privilege that includes an experience that can be painful enough to cause depression, escape through street drugs, and suicide. Suffering, and the use of suffering, have a place within religion. There have been people who have found in joy in suffering. Peter and other apostles, after being beaten, left the council “rejoicing that they were counted worthy to suffer dishonor for the name.” Ware’s closing examples in an article on martyrdom tell of martyrs’ joy. This puzzling behavior is difficult to understand but plays out what is said in the Sermon on the Mount, in a passage that is part of the Orthodox Church’s main liturgy: “Blessed are those who are persecuted for righteousness’ sake, for theirs is the Kingdom of Heaven. Blessed are you when men revile you and persecute you and utter all manner of evil falsely against you for my account. Rejoice and be glad, for your reward is great in heaven, for so men persecuted the prophets who were before you.” I cite these not because I expect it to be self-evident how people could respond this way, but precisely to suggest that there’s something in their version of suffering that is hard to appreciate today. Even if it is hard to see how, these texts indicate that there is something that may not be obvious about innocent suffering. Hebrews and I Peter elaborate and clarify: “For it was fitting that [God], for whom and by whom all things exist, in bringing many sons to glory, should make the pioneer of their salvation perfect through suffering,” If Christ himself was made perfect through suffering then it would seem incongruous to say that suffering may have perfected Christ but should not apply to people in his shadow. “For one is approved if, mindful of God, he endures pain while suffering unjustly. For what credit is it, if when you do wrong and are beaten for it you take it patiently? But when you do right and suffer for it and take it patiently, you have God’s approval:” God’s approval can be on the innocent sufferer even if the suffering is not externally labeled as suffering in the Lord’s name. To say that Christ “the pioneer of their salvation” was made perfect through suffering transforms our understanding of Christ and even more suffering. Elsewhere people learn from Christ, but in Hebrews we read shocking words: “Although he was a Son, he learned obedience through what he suffered.” (This is the only New Testament text where the Son is said to learn obedience.) In Hebrews 11.28, suffering is tied to faith, “portrayed as force sustaining God’s people in times of opposition and affliction, enabling them to overcome fear and temptation and fulfill his purposes for them,” which is the context to how Moses “considered abuse suffered for the Christ greater wealth than the treasures of Egypt, for he looked to the reward.” It may seem that such Biblical statements about suffering in the name of Christ only speak to the case of confessors and martyrs narrowly understood, but I Peter 2.19-20 forestalls such a reading and orients our understanding of innocent suffering as such. After describing Christ’s voluntary suffering as normative and monastic living as a manifestation of martyrdom, Ware writes, “What has just been said about Christ, about the martyr and the monk, is also true in a certain measure of every Christian without exception,” specifically in the sufferings of life. There are different forms of martyrdom which do not always include violence and death, but to be Christian is to be called to martyrdom. This is not resignation. Paul uses paschw of “his readers, Christians in general,” and can have a very active ring, meaning “‘to fight,’ perhaps ‘to fight an enforced fight,’… not ‘to be helplessly exposed or subject to alien pressure,’… ‘to prevail’. [emphasis added]”But the understanding that filters into the gift of myrrh is not simply a temporary measure for when the problem cannot be properly addressed yet. Cases of truly difficult suffering are not an exceptional case that this teaching also applies to; they are the central case under this view. This view of suffering applies from relative inconveniences up to major suffering including poverty and hunger, the death of loved ones, illness from cancer to depression, and many other cases. If the profoundly gifted are no unique center to the Biblical teaching because they are in no sense the only ones to suffer, that does not make their suffering trivial. Suffering increases as one approaches sainthood, and while suffering does not confer any automatic sainthood, Orthodox hagiography details a number of people with unusually difficult lives—the saints who are canonized as unusually good at living a normal human life—and some of their relics are said to miraculously stream, significantly enough, with myrrh. To see profoundly gifted suffering as outside the bounds of normal human life and to try an activist solution to bring it into the bounds of normal human life is to fail to realize that profoundly gifted suffering is a unique opportunity to live the normal Christian life, a life where gold and incense cannot be separated from myrrh. The reality of myrrh is a reality of suffering made positive in a context where suffering is no longer the last word, and it is not separate from gold for kingship and frankincense for divinity. Those saints who are fragrant with myrrh are fragrant with Heaven’s incense. There are some theologians who talk about humanity as the priest of Creation, and the massive repositories of skills acquired by the profoundly gifted can be a legitimate exercise of kingship—humans properly exercise kingship in the image of God’s kingship not only, and perhaps not primarily, when kingship is exercised over other people. There is a kind of joy and pleasure to learning and acquiring skills, and this may not always be situated within an explicit ecclesial setting, but then it no less constitutes part of what is normal and the gift of gold for kingship. Profound giftedness is both a gift from God and something whose use is not always good. Without going too far into the word “holy” (Hebr. qds, apparent etymological meaning, “separate”), I would like to talk some about what it means, and why we should not make too facile an identification of holiness with moral goodness. Holiness consists less in the creature’s relationship to the Creator than the Creator’s relationship to the creature. Giftedness is not unique in this regard, but it is giftedness that is not based on merit but is simply given by the Creator. It may not be achieved by being morally good, and it is misunderstood if it is treated as an accidental arrangement of cognitive faculties. And that lends to something paradoxical: the greater the gift, the greater the potential for evil in the use of that gift, even in the attempt to do good. Where there is untold human suffering, it may well be related to profoundly gifted plans to improve the world. Stfane Courtois’s The Black Book of Communism tells of millions who starved to death under Marx’s plan for a better world. One can name Adam Smith and the fathers of the Industrial Revolution as creating a masculinist vision to improve the world, a vision that on the ground left things worse for a number of people, and in particular women: Bob Goudzwaard’s Aid for the Overdeveloped West argues that the economic system that some profoundly gifted have helped build in the West is in fact not good for humans qua humans. Much of the industrialization that has led from wives working in adult company to housewives working in solitary confinement, destroying conditions that some feminists would like to reclaim, is transformation of society that stems from profoundly gifted people’s “good ideas” to make a better world. It is perfectly coherent to say that a profoundly gifted person will persuasively argue for a vision of a better world that practically results in incalculable human suffering. It is Virgil himself who died without reaching the patria, who saw ‘Italy’ only from a wave before he was engulfed forever. It is Virgil himself who stretches out his hands among the ghosts ripae ulterioris amore, longing to pass a river that he cannot pass. This poet from whose work so many Christians have drawn spiritual nourishment was not himself a Christian—did not himself know the full meaning of his own poetry, for (in Keble’s fine words) ‘thoughts beyond their thought to those high bards were given’. This is exquisite cruelty; he made honey not for himself; he helped to save others, himself he could not save. Lewis is summarizing Williams, and Williams’s point has strong theological relevance. Ware introduces one topic of discussion as “what Charles Williams calls ‘substituted love’, ‘coinherence’, or ‘the way of exchange’,” founded precisely on the above “law of the canoe.” Profound giftedness is not a help for making honey for oneself but making honey for others, and this is not because the profoundly gifted are any more altruistic: whether one is selfish or generous, profound giftedness helps paddling others’ canoes much better than it helps paddling one’s own. Alisdair MacIntyre’s Dependent Rational Animals argues that dependence is constitutive of human nature. Self-understanding as being independent requires sweeping acknowledgment of our dependence under the rug: true independence is probably impossible and certainly undesirable. If some people have difficulty achieving even a more relative independence, that is not an exception to how humanity normally works. It is continuous with large segments of humanity besides the profoundly gifted having more difficulty achieving a measure of independence. A few profoundly gifted experience worldly success—perhaps great—while many more experience surprising struggles. Lewis calls the law “exquisite cruelty,” and it is even crueler if a definition of justice in terms of paddling one’s own canoe is applied to the world, and one begins to suspect that even the Lawgiver, God, does not meet that standard of justice. But there is something in that picture that is not cruel, something that hinges on being willing to give up that standard of justice and accept the “law of the canoe” as terms of joy. If the profoundly gifted experience has extremes in its glories and difficulties, this form of interdependence is a difficulty that can and should be a glory, even if profoundly gifted may rarely be able to experience it as a particular form of human blessing. Comparable remarks could be made for other populations and communities. It seems a strained reading of Midas’s tale to argue that whatever Midas said, the king consciously thought he would retain the usual human ability to touch things without changing them into anything else, and in addition have the option to turn things to gold by touch when he so desired. Perhaps that would have been a far wiser thing to ask for. Despite this lack of foresight, it appears that when the king said that he wanted everything he touched to turn to gold, the “everything” he envisioned of course did not include his food and wine, and absolutely did not include his only daughter. It seems that Midas’s desire was for a fantasy version of a gift, and he was shocked when he received the real thing. Profound giftedness is not a curse like Midas’s. It offers much better prospects of living to old age, not to mention any number of other benefits. But it is, like any number of other human experiences, different from the inside than from the outside. There is another king associated with gold—in fact, six billion such royalty on one account, and Midas’s gold for his greed is in fact a base metal next to that gold that is from the same fountainhead as frankincense and myrrh. Human difference is not a matter of some people being at the human baseline, with everyone else starting from the same baseline but with added modifiers. In that sense everybody is on the baseline: it is mistaken to say that a profoundly gifted person is an “as modified by” representative of the majority, and neither more nor less mistaken than the opposite claim that most people are “as modified by” versions of the profoundly gifted, or comparable pairs of remarks spanning other human differences. Differences can be a chasm—sometimes requiring a great leap to bridge,—but when one can and does bridge the chasm, one may learn not of one more adjustment that can be made to a baseline centered on one’s own group, but a deeper understanding of what the baseline is and is not. In that sense there is nothing distinctive about profound giftedness being different from the inside and from how one would imagine it from the outside. It is illustrative of the human. Ashbrook Harvey, Susan, Scenting Salvation: Ancient Christianity and the Olfactory Imagination, Berkeley: University of California Press 2006. Buttrick, George, The Interpreter’s Bible, Abingdon Press 1952. Carson, D.A. et al. (eds. ), New Bible Commentary: 21st Century Edition, Downer’s Grove: InterVarsity Press 1994. Clark, Stephen, Man and Woman in Christ, Ann Arbor: Servant 1980. Courtois, Stephane et al., The Black Book of Communism: Crimes, Terror, Repression, Boston: Harvard University Press 1999. If one wishes to take seriously that profound giftedness and good intentions can cause incalculable suffering, this text covers something that is better not ignored. Dostoevsky, Fyodor, Crime and Punishment, New York: Random House 1956. L’Engle, Madeleine, Walking on Water: Reflections on Faith and Art, Wheaton: Shaw 1980. In my argument about gold and kingship, I have talked about a profoundly gifted accent to work. Giftedness as such is incidental at best to Madeleine l’Engle’s focus, but this is a perspective on artistic work, a work that is close to contemplation, and if it does not have a profoundly gifted focus it still has a profoundly gifted perspective as the basis to explore artistic work as a whole. Feldman, David, “A follow-up of subjects scoring above 180 IQ in Terman’s ‘Genetic Studies of Genius'”, in Exceptional Children, vol. 50 no. 6 1984, 518-523. This study makes the briefest passing mention that one of Terman 1925’s very few profoundly gifted subjects “took his own life,” without the briefest passing suggestion of any way this tragedy might be something to learn from, might be something related to the profoundly gifted experience, or could even be preventable. (Statistical analysis is impossible for a small sample, but if one person in a twenty-nine person sample committed suicide, this is hundreds of times higher than the population at large, or even demographics like those suffering from major depression.) This feature is symptomatic of a broader tendency in Feldman to be a generic summary without insight, and this is part of why I prefer the more qualitative studies such as Hollingworth 1975 or Morelock 1995. Freeman, Doreen, “A Feminist Theology of Disability”, in Feminist Theology 29 (2002), 71-85. Fitzgerald, Allan, Augustine Through the Ages: An Encyclopedia, Grand Rapids: Eerdmans 1999. Galton, Francis, Hereditary Genius: An Inquiry Into Its Laws and Consequences, London: Macmillan 1892 (1869). From the introductory chapter Galton takes positions offensive even in his own day, and, to pick one example, his stand for intelligence-centered eugenics as a moral duty earns Galton’s vile reputation today. His study seems to be less concerned about describing or studying genius in the sense offered by other sources than making a minimal study of his subjects sufficient to move on to his real interest, identifying whether genius is hereditary enough to bolster the eugenics he advocated. On a more positive view of the study of giftedness, Galton can be read as indicating how far the study of giftedness has come since Galton’s approach. Too much of Galton’s attitude lingers in later literature, but Webb 1980 bases his argument on a completely different footing: when he appeals for reform and cites a statistic that gifted education is part of special education but receives per capita less than three cents on the dollar compared to other special needs populations, the argument is not that gifted people are entitled to better treatment because they are superior. The argument is that special needs should be treated in proportion to the need. He places giftedness as a greater special need than most people realize. While acknowledging that the gifted population may be one of few special needs populations which is envied, one may hope that future literature may shift further away from Galton in the direction of recognizing the gifted population as having legitimate if perhaps unanticipated special needs, and given proportionate treatment to the form of special needs. Goleman, Daniel, Emotional Intelligence: Why It Can Matter More than IQ, New York: Bantam 1995. This controversial book treats one of several important aptitudes besides those studied here. The reason this article studies only one type of giftedness out of many is not because it’s the only interesting kind of intelligence (emotional intelligence may be more important), but a limitation of what can reasonably be treated in a single paper. Goudzwaard, Bob, Aid for the Overdeveloped West, Oshawa: Wedge 1975. Gross, Miraca, “The Early Development of Three Profoundly Gifted Children of IQ 200,” in Klein, Pnina; Tannenbaum, Abraham (eds. ), To Be Young and Gifted, Norwood: Ablex 1992, 94-138. This article is probably the best short sampling that offers a sense of human encounter through thick description of profoundly gifted children, and may serve as an orientation to the terrain of profoundly gifted children before tackling Hollingworth 1975 and Morelock 1995. Gross, Miraca, “Factors in the Social Adjustment and Social Acceptability of Extremely Gifted Children,” Ohio Psychology Press 1994 as seen online at http://www.gt-cybersource.org/Record.aspx?NavID=2_0&rid=10586 on 1 January 2007. Rather than thick description this article provides an analysis of social issues surrounding the profoundly gifted and why their position requires them to deal with social challenges that are not as much of an issue for others. Hayward, Jonathan, Artificial Intelligence, AI as an Arena of Magical Thinking for Skeptics: Cognitive Science, and Eastern Orthodox Views on Personhood, Master’s Thesis (Cambridge University), 2004. A study of the significance and power of basic human intelligence that can sometimes be overlooked in the study of giftedness. Hollingworth, Leta, Children Above 180 IQ: Stanford-Binet Origin and Development, New York: Arno Press, 1975 (1942). A classic study offering thick description of profoundly gifted children. Hollingworth has not been superseded. Honderich, Ted (ed. ), The Oxford Companion to Philosophy, Oxford: Oxford University Press 1995. Howard, Pierce, The Owner’s Manual for the Brain: Everyday Applications from Mind-Brain Research, Austin: Bard 2006. Also readable as “A layperson’s introduction to the culture and prejudices of cognitive psychology/cognitive science,” but a valuable resource nonetheless, and the only psychological work I know that is not specialized in giftedness but offers an on-target treatment of profound giftedness. Keselopoulos, Anestis, Man and the Environment: A Study of St. Symeon the New Theologian, Crestwood: St. Vladimir’s Seminary Press, 2001. Kittel, Gerhard, Theological Dictionary of the New Testament, Grand Rapids: Eerdmans 1976. Klein, Ann, “Fitting the School to the Child: The Mission of Leta Stetter Hollingworth, Founder of Gifted Education,” in Roeper Review, 23 (2), 2000, 97-103. Kreeft, Peter, Three Philosophies of Life: Ecclesiastes: Life as Vanity; Job: Life as Suffering; Song of Songs: Life as Love, San Francisco: Ignatius 1989. Landy, Frank, “The Long, Frustrating, and Fruitless Search for Social Intelligence: A Cautionary Tale,” in Murphy, Kevin (ed. ), A Critique of Emotional Intelligence: What Are the Problems and How Can They Be Fixed?, Mahwah: Lawrence Erlbaum 2006, 81-123. An opposing views piece to (Howard) Gardner theory, including Goleman 1995. Lewis, C.S., That Hideous Strength, New York: Scrivener 1996. Lichtenstein, Aharon, “The Duties of the Heart and Response to Suffering,” in Jewish Perspectives on the Experience of Suffering, Northvale: Jason Aronson, 1999. Macintyre, Alisdair, Dependent Rational Animals: Why Human Beings Need the Virtues, Chicago: Open Court 1999. Maloney, George, Gold, Frankincense & Myrrh: An Introduction to Eastern Christian Spirituality, New York: Crossroad 1997. McVey, Kathleen, Ephrem the Syrian: Hymns, New York: Mahwah 1989. Morelock, Martha, The Profoundly Gifted Child in Family Context, UMI 1995. This dissertation studies in depth two profoundly gifted children who represent two forms of profound giftedness, Bethany Marshall (profound giftedness focused in a single area, in this case music performance) and Michael Kerney (profound giftedness spread out over many areas). The latter represents someone who is exceptional even for someone who is profoundly gifted. In some sense Morelock is a complement to Hollingworth 1975, but includes significant analysis alongside its thick description. O’Brien, David; Shannon, Thomas, Catholic Social Thought: The Documentary Heritage, Maryknoll: Orbis 1992. Schmemann, Alexander, For the Life of the World: Sacraments and Orthodoxy, Crestwood: Saint Vladimir’s Seminary Press 1973 (1963), 17. Smets, Alexis; van Esbroeck, Michel (trs. and eds. ), Basil de Césare: Sur l’Origine de l’Homme, Paris: Cerf 1970. Sword, L., “Gifted Children: Emotionally Immature or Emotionally Intense?” Gifted and Creative Services, Australia, as seen online at http://www.gt-cybersource.org/Record.aspx?rid=12310 on 1 January 2007. Terman, Lewis et al., Genetic Studies of Genius, Stanford: Stanford University Press 1925 (vol. 1), 1926 (vol. 2), 1930 (vol. 3), 1947 (vol. 4), 1959 (vol. 5). Webb offers reasons why Terman’s methods of identifying gifted people may have been unintendedly biased in favor of the members of the gifted population who enjoyed the greatest social advantage. Terman uses the word “genius” in the title for a population that mostly overlaps the range of “socially optimal intelligence,” without that much attention to profound giftedness. However, Terman offers a landmark study and almost everybody stands on his shoulders even in criticizing him. Thunberg, Lars, Microcosm and Mediator: The Theological Anthropology of Maximus the Confessor, La Salle: Open Court, 1995. Vasileios (Archimandrite), Hymn of Entry, Crestwood: Saint Vladimir’s Seminary Press 1984. Walton, John et al., The IVP Bible Background Commentary: Old Testament, Downer’s Grove: InterVarsity Press 2000. Ware, Kallistos, The Orthodox Church, New York: Penguin 1997 (1963). Ware, Kallistos, The Orthodox Way, Crestwood: Saint Vladimir’s Seminary Press, 1995 (1979). Ware, Kallistos, “Seek First the Kingdom: Orthodox Monasticism and Its Service to the World,” in Theology Today, April 2004, 61.1, http://proquest.umi.com/pqdlink?did=623880061&Fmt=7&clientId=9148&RQT=309&VName=PQD as seen 11/12/06. Ware, Kallistos, “What is a martyr?” in Sobornost Incorporating Eastern Churches Review, London: Fellowship of St. Alban and St. Sergius, V.1 (1983), 7-19. Webb, James; Meckstroth, Elizabeth; Tolan, Stephanie, Guiding the Gifted Child: A Practical Source for Parents and Teachers, Columbus: Ohio Psychology Publishing Company, 1982. Webb ties together a great many things in this overview of the spectrum of giftedness (including profound giftedness). Where the sources I recommend for profound giftedness (Morelock 1995, Hollingworth 1974) offer qualitative thick description, this source incorporates theory, thick description, and practical advice into a picture that better than anything else I have seen in its insight into the entirety of the gifted experience. Williams, Charles; Lewis, C.S., Taliessin through Logres, The Region of the Summer Stars, and Arthurian Torso, Grand Rapids: Eerdmans 1974. Ware 1997, 32; cf. Ware 1995, 34. Lewis 1996, 370: a character breaks from description of Arthurian grandeur to discuss how this in no way makes Britain superior because each nation has its own characteristic glory: each nation is distinctive and none is superior. Much the same could be said of various populations that are/might be given thick description through the methods of this paper. Ashbrook Harvey 2006, 254n138. I cannot here explore the suggestion, mentioned in Ashbrook Harvey 2006, 33, that “gold” may represent an underlying Aramaic term for another herbal aromatic. Hymns on the Nativity 19.4 in McVey 1989. Hymns on the Nativity 9.15. I Corinthians 15.45; cf. I Corinthians 15 and specifically 15.22. John Paul II, Laborum Exercens, 1981. Cf. Matthew 25.14-30 and I Corinthians 12. Landy 2006 provides an opposing view. Nicolas Cabasilas, in M. Jugie, ‘Homélies mariales byzantines,’ Patrologia orientalis, XIX, fasc/, 3, 1925, p. 463, as quoted in Lossky 1976, 141.
 http://www.holyannunciation.org, as seen on 22/11/06. Michael Pichowski as cited in Sword, online. Webb 1982, 191-204: an entire chapter treats this. The Divine Liturgy of St. John Chrysostom. One hagiographical account may be seen at http://www.roca.org/OA/25/25d.htm, “And lo, the Star… St. Simon the Myrrh-gusher,” as seen on October 9 2006. Like most hagiography, this is considered part of the Orthodox tradition of “biography as theology,” theology given flesh in a person’s life. Schmemann 1973 (1963), 17; Keselopoulos 2001, 57. See i.e. Keselopoulos 2001, 57, 64 and comments about Genesis 1:26-8 above. If one is prepared to accept that truly traditional societies are something other than traditional roles attemptedly imposed on post-Industrial Revolution living conditions, then Clark 1980 provides an analysis largely of how women have suffered under certain changes, even if it doesn’t focus on who contributed “good ideas” behind the changes. The Heavenly/Purgatorial suffering found in Job, in Kreeft 1989, 59-96. The Hellish suffering found in Ecclesiastes, in Kreeft 1989, 13-58. Personal conversations with different profoundly gifted, 2001. Personal conversations with profoundly gifted, 2001.